The 7 Best Doughnuts Shops in Arkansas! Doughnuts. Who doesn’t love those fried rings of sweetened dough? Arkansans are no different than the rest of the country—our doughnut lovers are on the hunt for the best around. Here are 10 great doughnut shops serving up the best in the Natural State. Jeri-Lin’s has been serving some of the best doughnuts in Arkansas since 1969! This mom-and-pop doughnut shop is open Tuesday through Saturday from 6 a.m. to 2 p.m. Some of the most popular menu items include the cinnamon doughnuts and chocolate eclairs. You’ll find doughnuts as fresh as the mountain air here at Old Tyme Donuts in Springdale. This family-owned and operated doughnut shop has been serving the Northwest Arkansas area since 1992. Old Tyme Donuts features over 30 kinds of doughnuts and also serves sausage biscuits, kolaches, and biscuits and gravy. Don’t be surprised if there is a line out the door of this popular doughnut shop in Benton! From the staff to the doughnuts, everything here is sweet. Customer favorites include bear claws and classic glazed doughnuts. Krispy Kreme may be a well-known international chain, but Arkansans love these doughnuts just the same. Why? Because, they are fresh, warm, and FREE when the red light is on! From the classic glazed and traditional cake doughnuts to the cinnamon twist and emoji doughnuts, you’re sure to find a favorite at Krispy Kreme. This national franchise has been making life delicious since the end of the Great Depression. Shipley Do-Nuts features several doughnut styles, including the yeast do-nut, the filled do-nut, and the cake do-nut. The locals rave about this cash-only doughnut shop in North Little Rock. Featuring some of the freshest doughnuts in Arkansas, Mark’s Do-Nut Shop is a must for all doughnut-lovers in the Central Arkansas area. 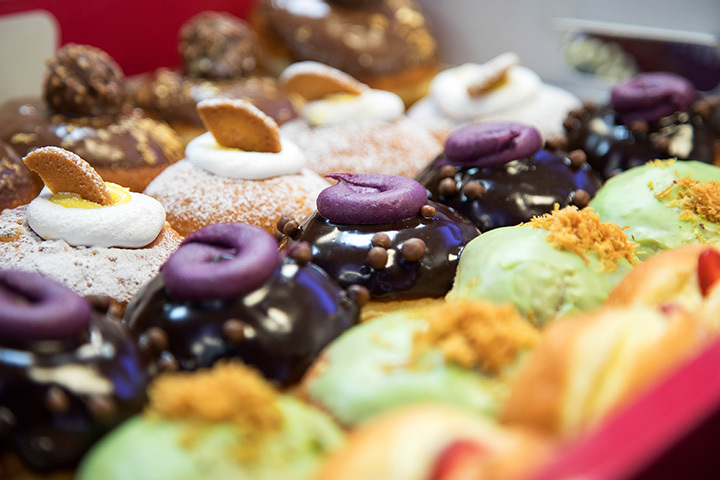 This international doughnut chain has been making delicious doughnuts since it was founded in 1954. Core menu items include raised doughnuts, cinnamon rolls, cake doughnuts, and, of course, that rich coffee we all love.